A common need among businesses is mobile apps is handling master-detail relationships. In a master-detail application, information is displayed using a combination of a "master" list of records with a "detail" to show related data. For example, a list of customers that, when selected, displays a customer's orders. The List, FormView, and ControlBar controls make it possible to build master-detail mobile apps that are both light-weight and responsive. 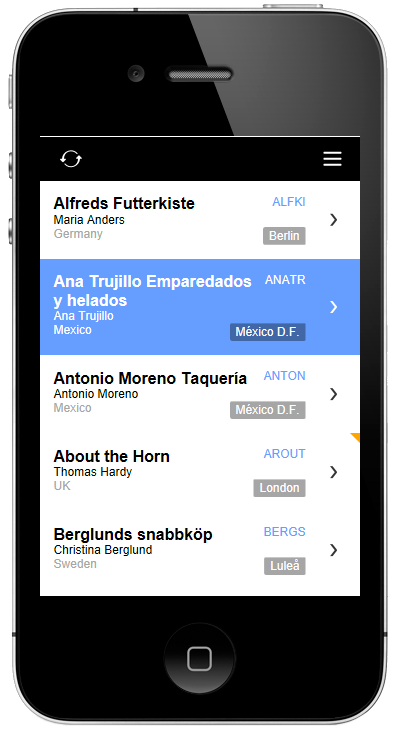 With the introduction of the ControlBar control in Alpha Anywhere v4.3, integrating navigation into mobile apps is far easier to accomplish. To demonstrate how the FormView and ControlBar controls enable you to build lightweight, responsive mobile apps, we have put together two new video series. The first video series shows you how to the FormView control can be used for editing large records - records with a large number of fields. If a large number of fields need to be edited, using the List control's Detail View can cause a major performance hit. This is because one control is created for each editable field in the record. Using the FormView control, a single Editor can be used to edit all of the fields in the control. In addition, because the FormView uses client-side templates to display the controls, the amount of data downloaded for your application is significantly reduced. To how the FormView control can be used for editing records with tens to hundreds of fields while keeping load times quick, click here. The second video series is a tutorial on building a master-detail mobile application that is used to update Customer and Order information. In this tutorial, you will learn how to build a master-detail application using the List, FormView, and new ControlBar controls. The tutorial requires access to the Northwind database. 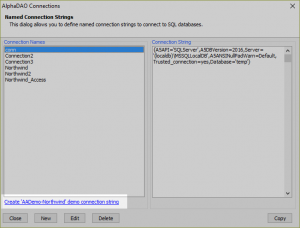 You can use the new "AADemo-Northwind" connection string which is a pre-built connection string that connects to the LocalDB version of the Northwind database. If the "AADemo-Northwind" connection string is missing, you can easily recreated using the "Create 'AADemo-Northwind' demo connection string" link in the connection strings dialog (shown below.) Click here to start the master-detail mobile application tutorial. We also have several other tutorials on building master-detail apps. These tutorials demonstrate how to build a master-detail app using Grid Components or Repeating Sections in a UX. The approaches described in these tutorials are best suited in web applications. Building Master-Detail Applications with Repeating Sections - Repeating Sections are a type of container in the UX Component that generate rows of data controls that can be used to display or update records. There is no limit to the number of Repeating Sections you can place in your component. However, Repeating Sections do not support "nesting", meaning you cannot create a Repeating Section inside a Repeating Section. To learn how to create a Master-Detail application using Repeating Sections, click here. Building Master-Detail Applications with Grid Components - For web applications, the Grid Component is a powerful component for viewing, searching, and modifying data in a database. Grid Components are best for web or desktop applications. To learn how to build a Master-Detail application using Grid Components, click here.